Saltwater splendor at the Nautilus South Beach. All photos courtesy of Nautilus South Beach. Can there ever be too many tropical, midcentury mod vibes on South Beach? Kate Donnelly thinks not. 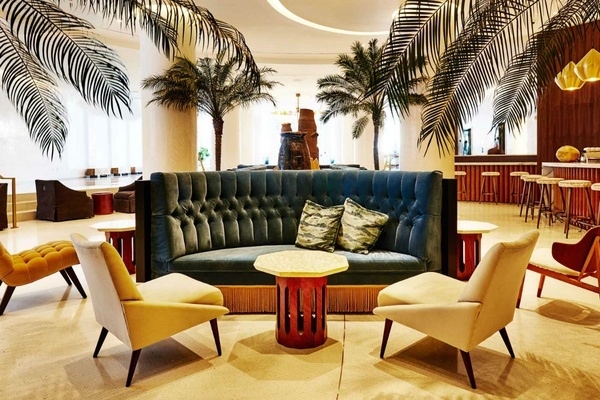 Gentedimontagna's contributing editor checks into the 1950s-inspired Nautilus, the latest hotel to hit Miami's shores. The tropical vibes of the newly opened register high on the jet-set meter, where the many touches of midcentury wonder easy-breezy glamour and 1950s architectural details like a sunken lobby let guests delight in the Miami of yesteryear. The space is brought up to speed with neo-pop contemporary art installation Wonderwheel, a line of 18 works curated with Depart Foundation and Cura. 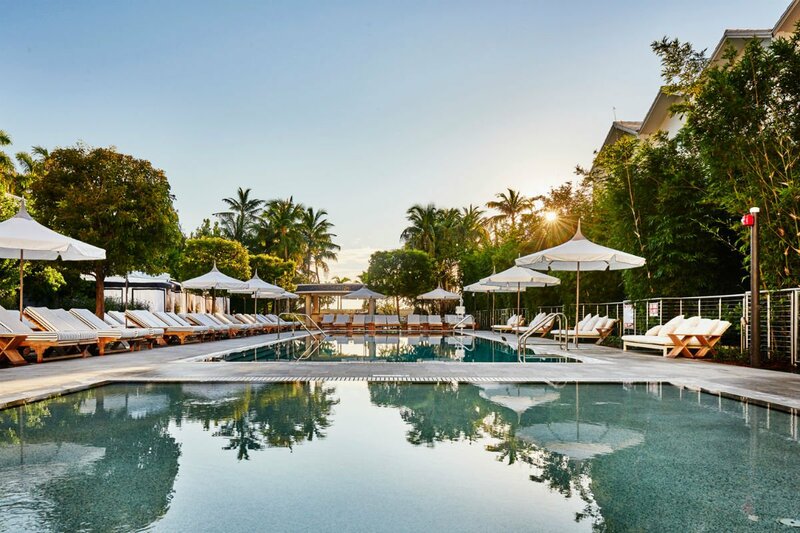 Already known for their hip boutique hotels in New York and Los Angeles, this addition to the group projects the same chilled-out charm at its sun-drenched South Beach locale. Bowing to architect Morris Lapidus (the man responsible for many venerable Miami landmarks like the Fontainebleau), the building plays on the old-school glam of this former hot spot and retained his signature detail, a restored winding "staircase to nowhere," along with curvilinear walls, terrazzo floors, low-slung upholstery chairs and tufted velvet couches, and just-buffed mosaic columns. The lobby at Nautilus South Beach. 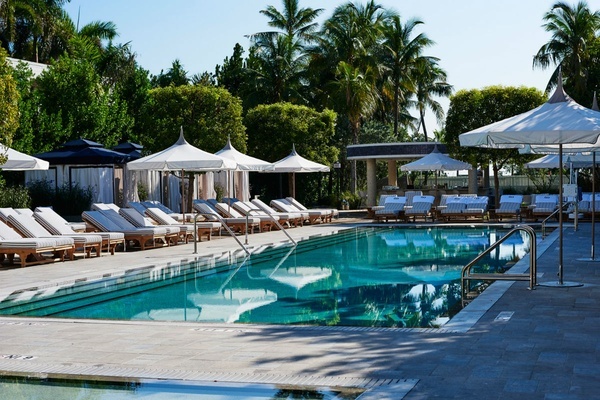 A long and narrow heated saltwater pool with an underwater sound system is flanked by swaying palms and dense loungers, conjuring the notion of a friend's backyard. Gratefully, the scene doesn't hoard big, obnoxious crowds — which makes it great for relaxing with a book or sipping a drink relatively undisturbed. If you're feeling social, swagger over to the pool bar, Don Draper-style. Nearby, ballers can install themselves in eight small cabanas and usher in bottle service. (This is Miami.) A bamboo-encased corridor leads to a small lawn of swinging Bolivian hammocks (hello, Atlantic Ocean!) mere steps from the beach, where blue-and-white striped umbrellas are pitched and waiting for beach bunnies. 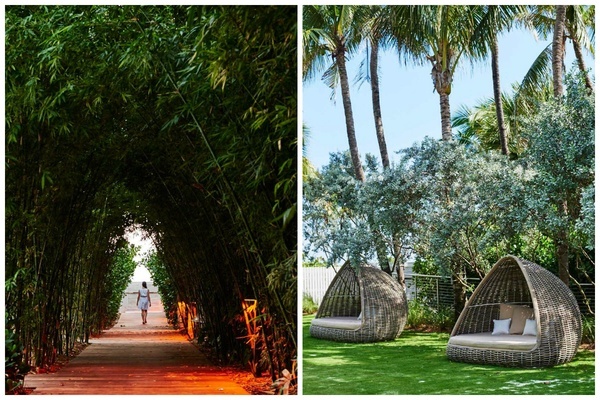 Bamboo walks and cabanas next to the beach. It's always sunny in South Beach. 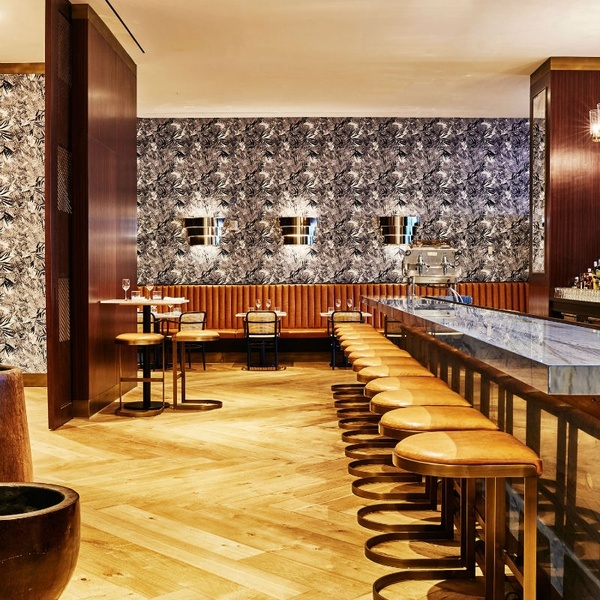 Chef Alex Guarnaschelli's Driftwood Room is handsomely outfitted in walnut walls, wood floors, and a copper bar that keeps things in seafaring mode. 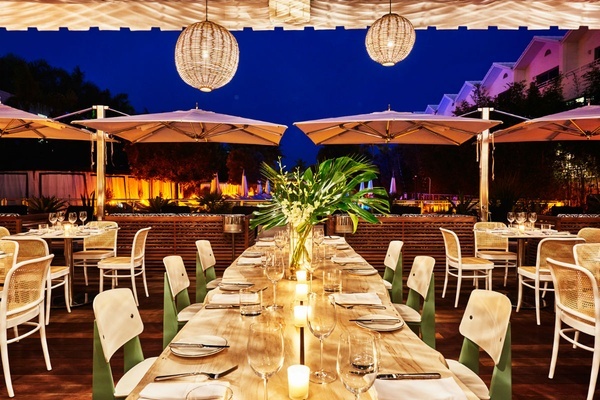 Prime outdoor tables, curved booths, wicker orbs, and Prouve chairs are arranged under lights on the white-washed patio. Dinner includes herb-crusted lamb kabobs and cold-water lobster with spinach and coconut palm. Dessert brings passionfruit donuts with vanilla bean custard. Dine in style at Driftwood Room. A room with a steamer trunk bar. 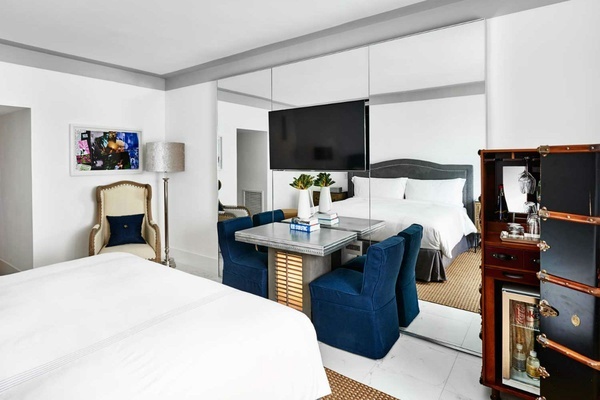 The ample 250 guestrooms are designed with maritime grays, whites, and navy accents, tiled floors, floor-to-ceiling mirrors, and framed collages by fashion lensman Sante D'Orazio. A focal point remains the large vintage steamer trunks that open to reveal fully stocked mini bars. The relatively small bathrooms are stocked with REN toiletries. 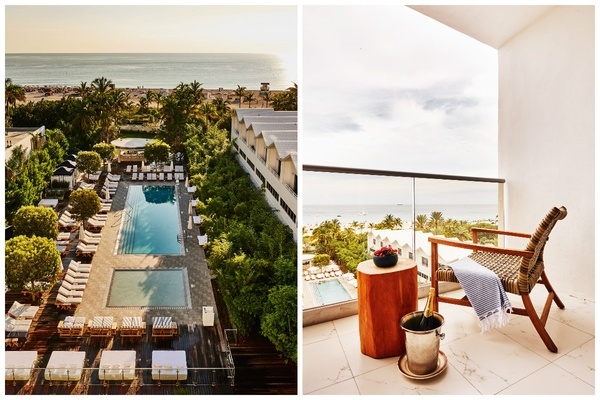 The best rooms to book are the light-flooded, generously sized King Oceanfront Balcony rooms with large outdoor spaces. Those who want a brush with glamorous 1950s South Beach. Those who crave big pools and crowds, multiple restaurants, and what feels like a runway of people. The terrace at Driftwood Room. Given SoBo's endless hip and fancy hotels and an equally high-flautin' dining and drinking scene, it's much more interesting to take the road less travelled. At Freehand, the homey dishes a daily catch with coconut-curry broth, Israeli couscous, and avocado for the family. Just as great are Jimmy's kimichi fried rice with duck eggs and scallion and Gabe's arepa platter with the works. After dinner comes a mandatory digestif at , where serious cocktails are poured. If nobody's tired, the next pitstop is divey and legendary Mac's Club Deuce Bar (222 14th St.; +1-305-531-6200) with its darkly lit bar and neon signage and polish off a nightcap. Without a doubt, the best tacos in the city are at the pint-sized authentic outdoor , which was founded by a Broken Shaker alum. A fact: The blue corn masa, ground daily, is flown in directly from Mexico. The result: delicious thick-cut tortillas cut into small pieces, fried and served with fresh guacamole. For tacos (three or four to feel satisfied), the best options are huitlacoche (corn fungus), nopales (cactus), and the usual suspects like al pastor and carnitas, dressed with house-made sauces. The legendary Las Olas Café (644 6th St.; +1-305-534-9333) is always a good choice for a thin Cuban sandwich with extra mustard and pickles. Proper coffee nourishment is a café con leche (a shot of Cuban coffee and hot, steamed milk) at For lunch or a pit-stop after boozing, on South Beach is always hopping. Miami International Airport is about 20-25 minutes away and Ft. Lauderdale International Airport is a 40-minute drive. Cabs and Ubers are available, though the latter is usually more economical. There's no need to rent a car, especially given the city's hefty parking and valet fees. A King Superior room starts at $229 a night. .